Large ferries don’t arrive on Antiparos. 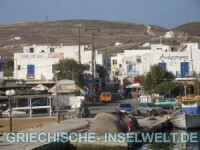 First you have to go to Paros and then with small boats from Paros port (Parikia) to Antiparos. Alternatively, you can also take the bus to Pounda and then go to Antiparos with a small ferry. The following ferries relate to ships to and from Paros.